Do you want to live to see your 100th birthday? Then start upping your pork intake. Do you want to live to see your 100th birthday? Then start upping your pork intake. According to Eater, one Sichuan woman who lived to be 117 ate pork three times a day. Sounds like a good diet to us. Here, 15 delicious pork recipes to make for breakfast, lunch and dinner. 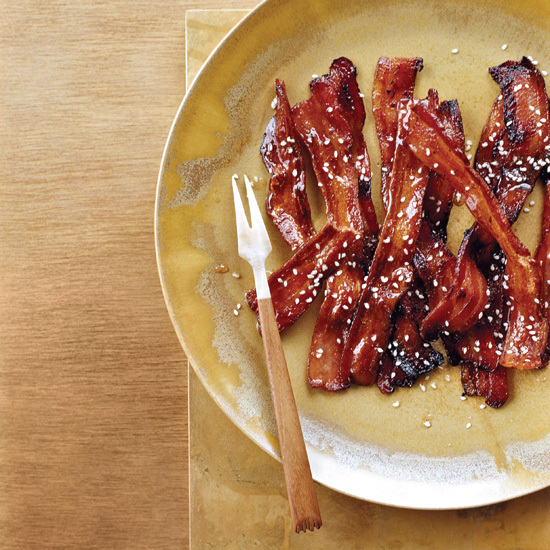 Slices of smoky bacon covered in a spicy honey mixture are great at breakfast and addictive enough for a midnight snack. This irresistible breakfast sandwich is a hybrid of an egg salad sandwich and an Egg McMuffin. Pressed on a griddle, these breakfast tacos are almost like breakfast quesadillas. The secret to these delicious crêpes: lots of chopped herbs. The terrific filling for these sausage links is made with fresh-ground pork belly seasoned simply with sea salt, sage, and black and white pepper. Slicing the pork very thinly is the key to this sandwich. This quick soup comes together in 30 minutes. Country ham is an ideal accent in dishes like this homey pasta. This terrific noodle salad pairs zesty pickles with smoky grilled meat. This simple sandwich is filled with peppery pork and hoisin sauce. These pork chops are cut doubly thick, so it’s easy to give them a good char on the grill while keeping them super-juicy. This recipe needs just 20 minutes in the oven. This citrusy pork shoulder is grilled for a fantastic smoky flavor. Self-described “porketarian” Michael Symon uses incredibly succulent pork cheeks in this chili. Roasted garlic seasons this pork shoulder, which slow-cooks until tender.